It’s done! Finally! I have put a ton of effort into this beauty and am very happy with the result. Here is a “before” picture so you can get the idea of the nasty paint that covered this poor piece. 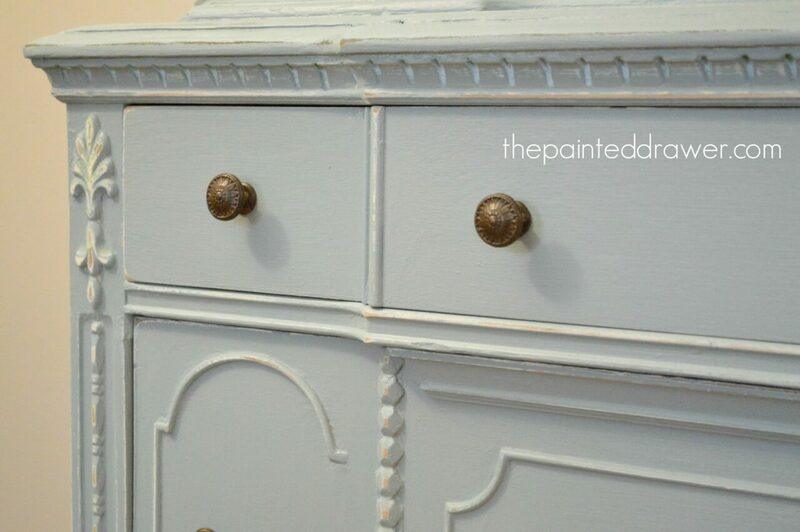 This chest is now a beautiful example of everything perfect with vintage furniture. 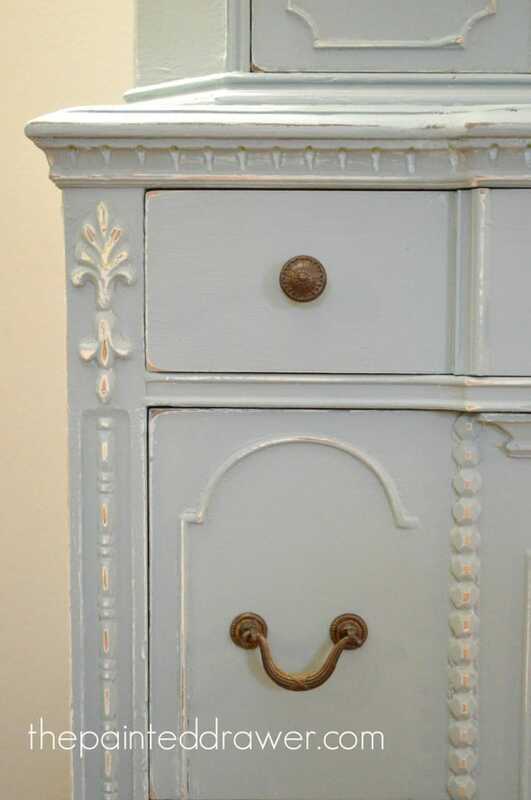 It has detailing in every place possible, starting with the top. 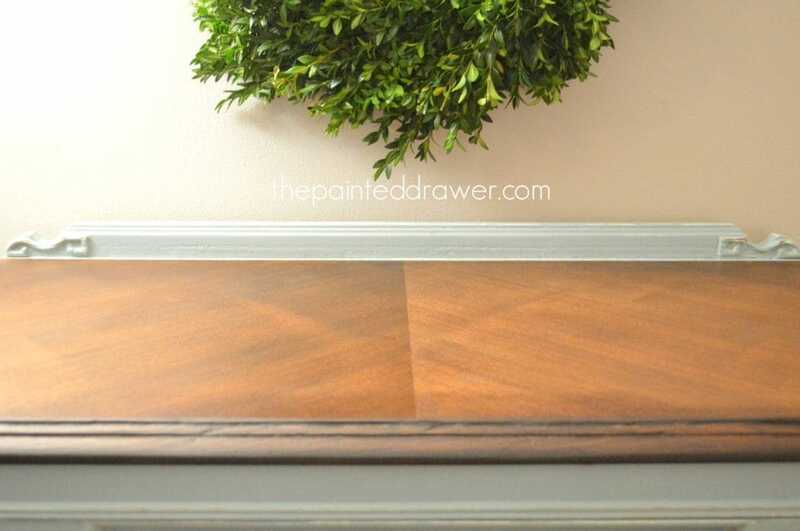 After I sanded off all the white, goopy paint, I discovered beautiful wood that was laid at an angle on each side to create a pattern. I stained it a dark walnut and it is gorgeous. 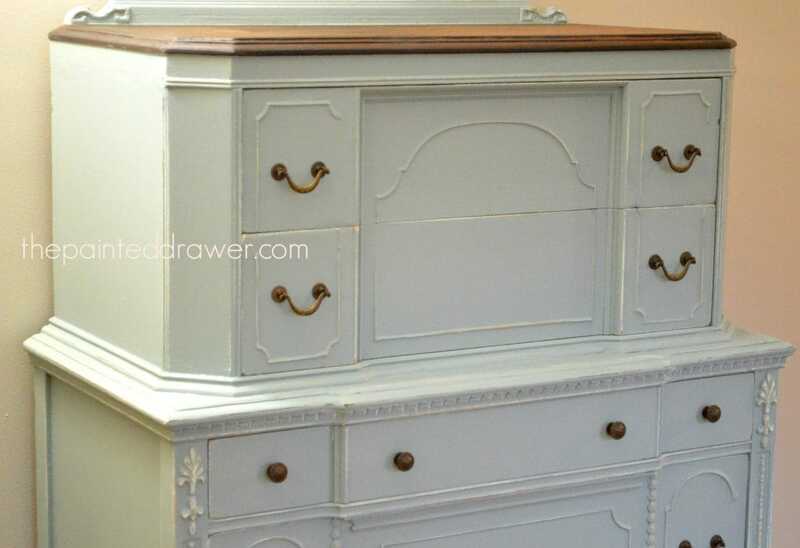 The sides of the top part of the chest are at an angle, which gives it a great shape. The bottom section of the chest has so much detail it is hard to describe. The pictures will have to do! 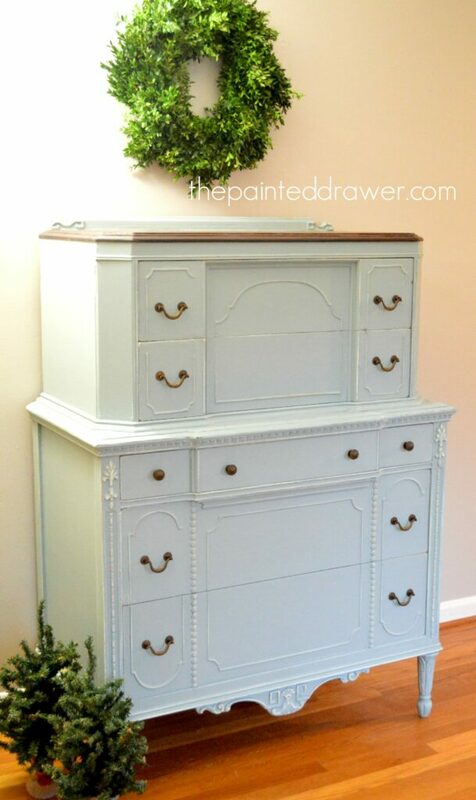 I used General Finishes Persian Blue over an initial coat of custom blue chalk paint. When I sanded back to distress, the original white paint and my undercoat of blue popped through. It looks so pretty and highlights all of that detail work. 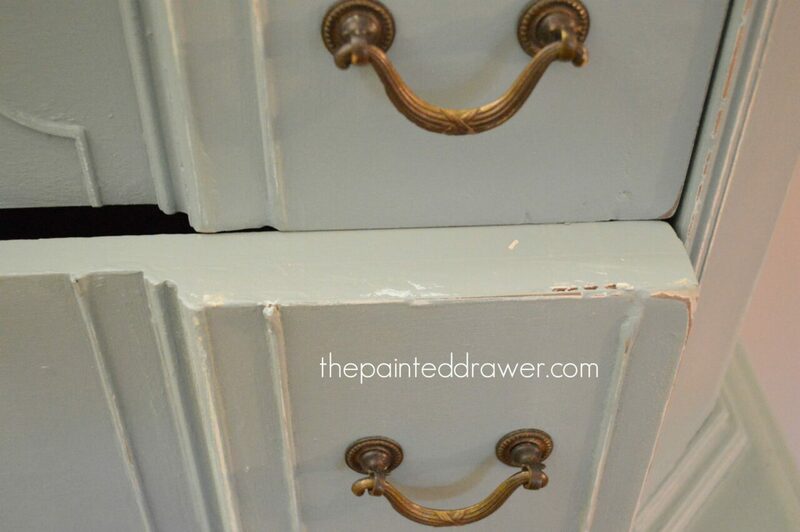 The drawers are the thickest, heaviest drawers I have ever encountered – this is a quality piece.. All of the original drawer pulls are intact and now tie in nicely with the darker top. 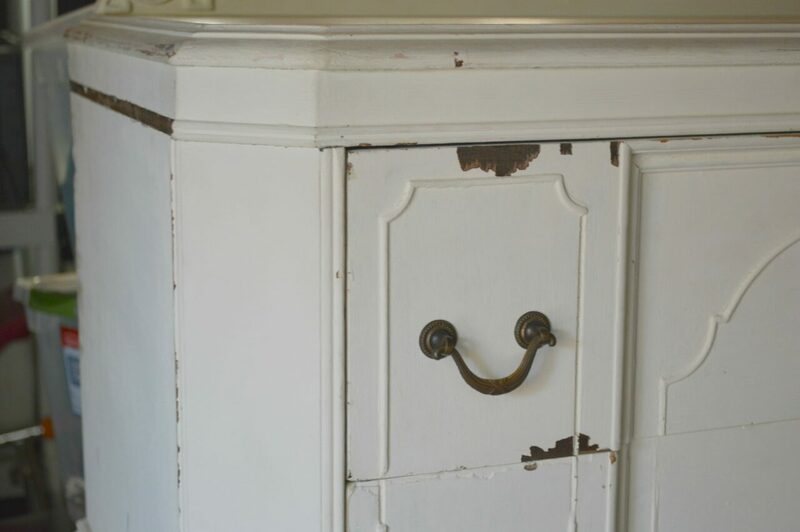 The lovely chest is missing parts of its original detail work but I love it as-is and wouldn’t change a thing. Now that I filled in and sanded back the missing pieces, it gives a faded softness to the piece. It is old and shows its lovely age. The definition of vintage charm! Definitely a Stunner! 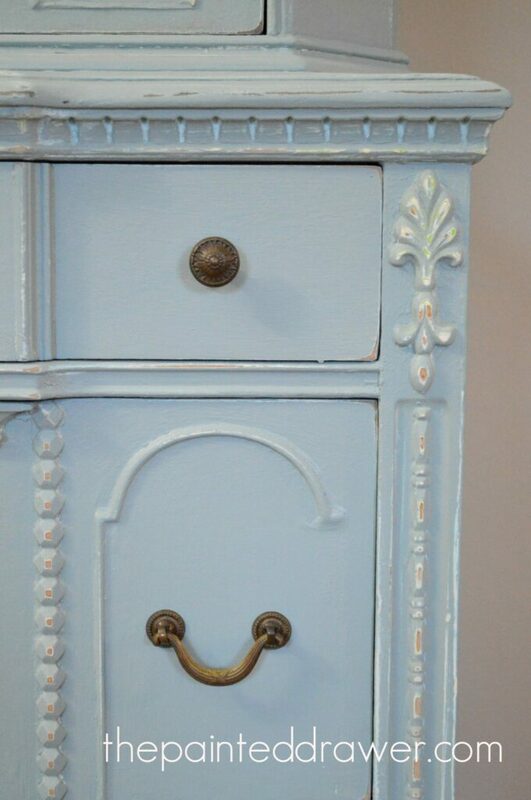 Love the details and your color choice! Thank you so much, Ardith. Happy holidays to you! And you are awesomely appreciated! Thanks so much! Thanks, Cassie! It was so much work trying to fix another person’s mess. So glad it finally turned out well! Wow! I love it!! Love that you gave us a little insight on how you got to the end result, stunning! It’s so beautiful! I simply love LOVE LOVE it. Absolutely wonderful! I’d have a very hard time letting go of this! Do you get to keep her? Ah, I only wish I could! I just listed her on Etsy and my site. This one will be tough to say goodbye to! Thanks so much! I loved the video! You are quite the cinematographer! 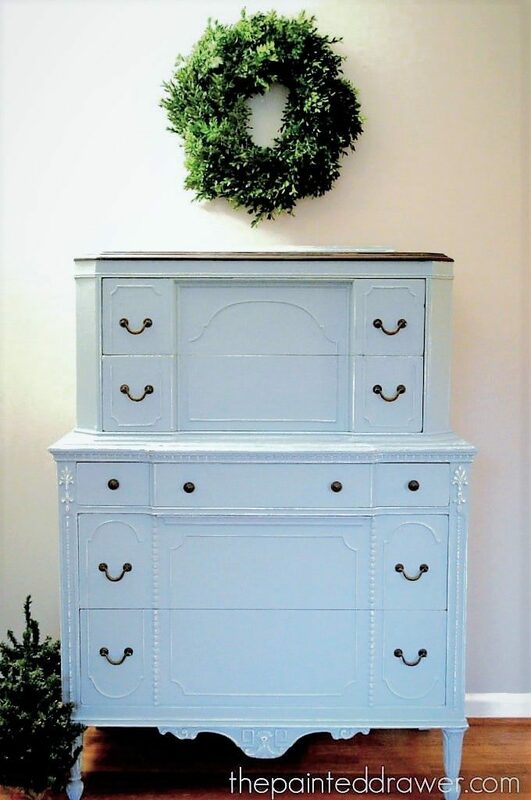 I love all the details and the choice of Persian Blue is perfection! Suzanne this is stunning – the color is so soft and looks great with the dark walnut top. Lucky is the person who gets this! Thank you so much, Marie! I hope you had a great Thanksgiving! NYNeena, you are right, Wedgewood IS what it looks like! From a distance I thought Suzanne had highlighted the areas with white and anxiously read on to see what she said. A closer look and her description revealed that it was the old color showing through. VERY pretty. And what luck that the old hardware was still there. It matches perfectly. You make me itch to get my hands back in the paint! You did a lovely job on this. The detail and moldings definitely show off that vintage charm. This is stunning! Great piece and LOVE the color! Oooh! I have a serious crush on this color. I love the little details on it too. You did a beautiful job!